Getting immunized against influenza every year is recommended for all adults and children 6 months and older. In June of this year the CDC and the ACIP (Advisory Committee on Immunization Practices) announced that “ Health care providers should not use live attenuated influenza vaccine (LAIV, FluMist, Nasal Flu) in the upcoming 2016-’17 season due to poor effectiveness.” The American Academy of Pediatrics supports this recommendation. Previously, the CDC and AAP had recommended either form of flu vaccine – the inactivated influenza vaccine (IIV) that is given by injection and is approved for all patients older than 6 months, or LAIV which is given by intranasal spray and is approved for healthy patients ages 2 through 49 years. However, new data presented to the ACIP showed that currently only the injection provides protection against flu. The ACIP assessed data from the past three influenza seasons and cited evidence of poor effectiveness of LAIV during this time period. So, we are stocking large quantities of inactivated vaccine formulations for those 6 months to 3 years and for everyone 6 months and up. We usually get our first shipment in early September. 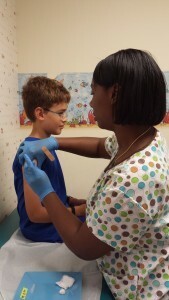 We will offer flu shots at any scheduled visit in the fall and as a “walk-in” for flu vaccine. We will once again, as a convenience, offer parent/grandparent/caretaker shots for $25.00 cash.